Imagine cooking in this pasta pot including utensils! Savor the aroma that will be delicious spaghetti, penne, or angel hair cooking in this Ragalta 8-Piece Stainless Steel Pasta Pot Set. 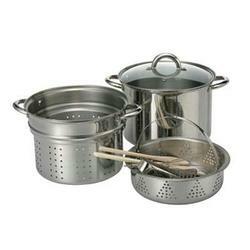 Try your favorites in the blanching basket, and the steam basket with handle. This set includes wooden spoon and spatula, a wisk, and spaghetti tongs. All you need to get you started! High quality stainless steel Offers durability, dependability, and good performance. Heat resistant glass lid Provides viewing of cooking food without lifting the lid and losing heat. Pan assortment Gives versatility in types of recipes prepared in this cooking ware.